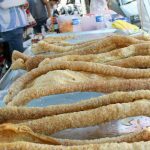 If Enrique is king of chicharrones, his wife Estela is the queen of Toluca-style chorizos. They have been married 36 years. They welcome legalization because they believe it will mean more business and fewer risks. California is leading efforts to push back against ramped-up deportation efforts. Earlier this week, the state’s Senate passed a so-called ‘sanctuary state’ bill that would prevent local and state police from using their resources to enforce federal immigration laws. Flaccid pinkish beige strips of pig skin sizzle as they sink into a vat of oil, where they transform into bumpy, crunchy chicharrones – or pork rinds in English. They are a specialty for a Los Angeles street vendor named Enrique. And his are so popular that the customers who line up to buy the popular snack call him the King of Chicharrones. Enrique is one of as many 50,000 street vendors in Los Angeles, who sell everything from chicharrones to caps, from tacos to mangoes, from pineapples to pupusas. Street vending has a long tradition in Los Angeles, but it has not been legal. Yet it is often the only kind of work available to undocumented immigrants. After many unsuccessful years of trying to legalize street vending in LA, the Trump Administration’s aggressive deportation efforts have given a sense of urgency to the long-delayed issue. Chicharrones – or pork rinds – are Enrique’s specialty. Lucero has been in the United States for more than 30 years and is one of dozens of vendors selling wares along a sidewalk in downtown Los Angeles. 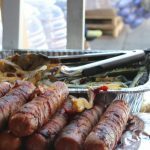 Bacon-wrapped hot dogs are one of LA’s signature street foods. An estimated 10,000 of LA’s street vendors sell food. They have been the target of most enforcement efforts in the city where street vending has been illegal until earlier this year. 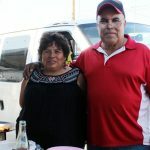 Enrique says street vending, which has been illegal in Los Angeles until earlier this year, has allowed him, and his wife Estela, to support a family of five and to even put a daughter through university. 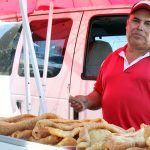 As popular as Enrique’s chicharrones are, he and other street vendors noted that sales have declined since the inauguration of Donald Trump. Immigrants from Latin America dominate as both buyers and sellers here, but enforcement actions have unnerved many. Merced Sanchez’s activism has taken her from selling hats and sunglasses on the street, to meeting with LA’s mayor and to speaking before City Hall. 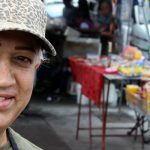 She’s been working with the East LA Community Corporation for years to legalize LA’s 50,000 street vendors. 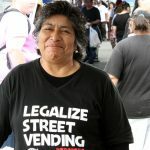 Earlier this year the LA City Council voted to at least decriminalize street vending, in part because undocumented immigrants could be deported for nothing more than getting busted for selling crispy pork rinds or the popular street staple, bacon-wrapped hot dogs. Enrique works alongside his wife of 36 years, Estela, who is known for her Toluca-style chorizos. She has grown weary of the risks, including equipment seizures and fines she’s faced of up to $700 per incident. “She says she feels, like, anxiety because she can’t do anything about it,” says an interpreter who relays Estela’s feelings to FSRN. But some members of the community at large feel their interests are falling by the wayside in the rush to green light. 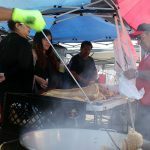 Gary Agass helped put together a community impact statement regarding street vending for his neighborhood council in the San Fernando Valley. There’s also the question about who will be at the head of the line for permits. “Are permits allowed based on citizenship? Citizens versus non-citizens? Green cards versus undocumented?” asks Agass. A major criticism of legalizing street vendors is that they will have an unfair advantage over brick and mortar businesses. One proposed solution is to limit street vendors to only two per block – pending the permission of the businesses in the area. Even though the council has approved the framework for legalization, the details of how to enforce and regulate LA’s street vendors are being hashed out at the city attorney’s office. In the meantime, lines continue to form in front of Enrique’s food stand. Without prompting, he offers that he and his wife have never been on government assistance and that he has never committed any crimes, contrary to a statement by the current president, who when campaigning said that many undocumented Mexicans are criminals, drug dealers and rapists. “He says, ‘can you say that all white people are crazy and they’re drug addicts, too?” Enrique tells FRSN through an interpreter. And despite his reputation as the King of Chicharrones, Enrique seems less proud of his signature snack than he is of his daughter’s university education. A dream made possible, he says, because he sells pork rinds on the streets of Los Angeles.